Friday was no April Fools' Day for Google, as the Circuit rules in its favor in two major cases. In the first, the Circuit affirms summary judgment of noninfringement of a searching system marketed by Google and Microsoft that is used by hundreds of the largest retailers in the country. In the second case, the panel throws out an $85 million verdict based upon alleged infringement of Google's Cloud Messenger Services. 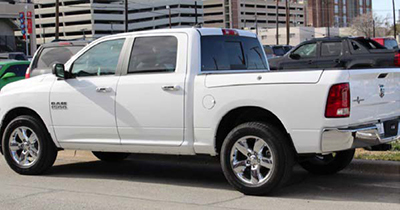 In the Clare case, the Circuit affirms summary judgment of noninfringement in favor of Chrysler in an action involving the RamBox cargo box used in many of Chrysler's pickup trucks. GeoTag appeals the decision of the District Court of Delaware finding that it had subject matter jurisdiction over (1) Google's First Amended Complaint, which sought a declaratory judgment that the '474 patent is invalid and not infringed; and (2) GeoTag's counterclaims, which alleged that Google infringed the '474 patent. GeoTag also challenges the district court's decision granting summary judgment that Google did not infringe the '474 patent. We affirm, although we find jurisdiction on different grounds. a search engine in communication with said database, said search engine configured to search geographically and topically, said search engine further configured to select one of said hierarchy of geographical areas prior to selection of a topic so as to provide a geographical search area wherein within said hierarchy of geographical areas at least one of said entries associated with a broader geographical area is dynamically replicated into at least one narrower geographical area, said search engine further configured to search said topics within said selected geographical search area. Importantly, the "dynamically replicated" limitation occurs after the system conducts a search within a limited geographic area. This appeal is an outgrowth of litigation that began in the Eastern District of Texas, where GeoTag sued more than 300 entities based on store locator services provided by Microsoft and Google. In response to GeoTag's Texas suits against its customers, Google filed a declaratory judgment action against GeoTag in the District of Delaware ("District Court"). The Complaint sought judgment that the '474 patent is invalid and is not infringed by the use of Google's web mapping services. GeoTag counterclaimed that Google AdWords—an online platform for displaying advertisements to users that conduct a search on Google's website—directly infringes the '474 patent. The District Court granted Google's motion for summary judgment that it did not infringe, holding that AdWords does not practice the "dynamically replicated" limitation in claim 1 because it does not search a narrow geographic area and automatically add results from a broader area; instead, AdWords conducts a broad search for all responsive ads and then consecutively filters the results. Shortly before the District Court issued its summary judgment decision, this court addressed declaratory judgment relief in Microsoft Corp. v. DataTern, Inc., 755 F.3d 899 (Fed. Cir. 2014). The District Court then permitted Google to file its First Amended Complaint and GeoTag moved to dismiss, asserting there was no subject matter jurisdiction. GeoTag alleged its counterclaims against Google were compulsory, not permissive, and therefore should be dismissed if the D. J. action lacks subject matter jurisdiction. The District Court denied GeoTag's motion, and also held that, even if the First Amended Complaint did not establish sufficient grounds for declaratory relief, there would still be subject matter jurisdiction over the counterclaims. In reaching the latter conclusion, the District Court found the counterclaims permissive, rather than compulsory, and held that it retained subject matter jurisdiction over the counterclaims. GeoTag principally argues that the District Court lacked subject matter jurisdiction over Google's First Amended Complaint, which seeks a declaratory judgment that the '474 patent is invalid and not infringed by Google. If the District Court lacks such jurisdiction, GeoTag continues, then it also lacks jurisdiction over GeoTag's patent infringement counterclaims. GeoTag argues that the patent infringement counterclaims cannot serve as an independent basis for jurisdiction. However, where a complaint and a counterclaim both raise issues arising under federal patent law, the district court may retain subject matter jurisdiction over the counterclaim pursuant to 28 U.S.C. § 1338(a), even if the district court later dismisses or finds a defect in the complaint that raises a question arising under federal patent law. The District Court retained subject matter jurisdiction over GeoTag's patent infringement counterclaims pursuant to § 1338(a), such that we need not determine whether the District Court properly found that it had jurisdiction over Google's First Amended Complaint. GeoTag's counterclaim arose under an Act of Congress relating to patents, 28 U.S.C. § 1338(a), and so the District Court retained jurisdiction over those claims, irrespective of any dismissal or defect in Google's First Amended Complaint. Thus, even assuming that the First Amended Complaint was dismissed or deficient in some respect, the District Court retained subject matter jurisdiction over GeoTag's patent infringement counterclaims. GeoTag alleges that, even if a permissive counterclaim could create jurisdiction, it makes no difference because GeoTag's counterclaims were compulsory. Because its counterclaims are compulsory, GeoTag continues, the court could not retain subject matter jurisdiction over its patent infringement counterclaims. However, this distinction based on counterclaim status has no bearing on jurisdiction under § 1338. Nothing in the text of section 1338 suggests that Congress conditioned its grant of jurisdiction on the compulsory or permissive nature of the counterclaim. Nor would the distinction make sense in disputes before the District Court, which has original jurisdiction of any civil action, regardless of the counterclaim status, Fed. R. Civ. P. 13(a)-(b) (permitting parties to file compulsory and permissive counterclaims). On appeal from a grant of summary judgment of noninfringement, we must determine whether no reasonable jury could find literal infringement or infringement under the doctrine of equivalents. GeoTag's infringement allegations principally concern the "dynamically replicated" limitation in claim 1. As previously noted, the "dynamically replicated" limitation occurs after the system conducts a search within a limited geographic area. Through that limitation, the system includes search results associated with the narrow geographic area and then automatically adds results associated with a broader geographic area. GeoTag alleges that the District Court erred in granting summary judgment that Google did not infringe. Specifically, GeoTag argues that (1) "the District Court erroneously added new limitations, including that dynamic replication requires at least two searches and that one of those searches must be inherited into the other search," and (2) "Google's AdWords System practices dynamic replication." It also contends that the District Court "wrongly substituted itself for the jury by finding that 'filtering' is not a search." The District Court properly granted summary judgment. AdWords searches its "entire database" of ads without geographic limitation, identifies "all possible results" independent of geographic restrictions, and then "consecutively filters" those results by, among other things, eliminating results not associated with the targeted geographic areas. Because AdWords searches its entire database without regard to geography and then filters the results, rather than searches only within a targeted geographic area and automatically adds results from outside that area in the manner claimed by the '474 patent, AdWords does not practice "dynamic replication" under any construction of that limitation. Indeed, AdWords' performance of a broad search of all possible ads, without regard to geography, means that it has no need or opportunity to "dynamically replicate" entries from a broader geographic area into a narrower one, as the '474 patent claims. Thus, no reasonable jury could find that AdWords infringes the patent. GeoTag alleges that the construction of the asserted independent claims was erroneous. Specifically, GeoTag alleges that, when the District Court construed "hierarchy of geographic areas" to mean "interrelated geographic areas such that there are parent geographic areas and child geographic areas," it improperly imported a parent-child limitation into the asserted independent claims. It also argues that, when the District Court construed the "dynamically replicated" limitation to mean "automatically inheriting at the time of a search," it improperly imported a parent-child limitation into the asserted independent claims from the specification and should have substituted "copying or inheriting" for "inheriting." Even if correct, these arguments do not warrant reversal of the District Court. As to "hierarchy of geographic areas," the construction of that phrase played no role in the grant of summary judgment. The District Court relied solely on uncontested aspects of dynamic replication in granting summary judgment. Because the construction of this term did not form the basis for any judgment of non-infringement by the District Court, it is irrelevant to the judgment that is on appeal and will not be addressed. Similarly, the contested aspects of the District Court's construction of "dynamically replicated" did not impact its grant of summary judgment. Specifically, the District Court did not find that how dynamic replication occurred (i.e., whether through inheritance or copying) answered the infringement question. Instead, it found that Google's AdWords does not practice "dynamic replication" under any construction of that phrase. Because the disputed construction did not form the basis of the District Court's summary judgment grant, we will not address it. SimpleAir sued Google for patent infringement, alleging that Google's Cloud Messenger Services infringe its '914 patent. A jury determined none of the asserted claims was invalid, and that Google infringed each of the asserted claims. A separate damages trial resulted in a jury award of $85 million to SimpleAir. The Eastern District of Texas denied Google's motions for JMOL. On appeal, Google asserts the claim term "a data channel" is indefinite under the Supreme Court's intervening decision in Nautilus, Inc. v. Biosig Instruments, Inc., 134 S. Ct. 2120 (2014), or alternatively, that Google does not infringe under the correct construction of "a data channel." Google also challenges the constructions of "transmission gateway" and "parsing said data with parsers," its application of the law of joint infringement, and the damages award. For the reasons set forth below, we determine the district court erred in its constructions of "a data channel" and "whether said devices are online or offline from a data channel associated with each device," and conclude that no reasonable jury could find infringement under the correct constructions. We therefore vacate the jury verdicts, and remand with instructions to enter judgment of noninfringement. The '914 patent provides a system for data communication connecting on-line networks with on-line and off-line computers. The invention involves the wireless broadcasting of "notification centric information," such as a notification alerting a user that an email message has been received. The patent explains that "third party developers can write different types of multimedia viewers which can easily be downloaded to the user system." The message associated with the notification centric information is transmitted "to the user interface alert panel causing an animated icon to fly to the alert panel notifying a user that a new message has arrived. Upon clicking the icon, the appropriate viewer is launched. Users can then display the context of the data on their computers." "Users can control which categories of information received from the broadcast network are processed and which are discarded. For example, if a user were not interested in sports, all sports information categories, such as baseball, football, golf, etc. can be selected for discarding." Users can also select specific subcategories, such as "specific teams for sports" or specific stock quotes, about which they wish to receive information. The patent explains that remote control provides a user interface for opening, closing and controlling viewers. The viewers are the means by which data received from the broadcast network is displayed to the user, and can include "graphics, data, sound files, and launch icons." The remote control is launched through the user interface alert panel. instantaneously notifying said devices of receipt of said preprocessed data whether said computing devices are online or offline from a data channel associated with each device. The District Court Erred in Construing "A Data Channel"
On appeal, Google notes the invention embodied in the '914 patent "is directed to transmitting information to a remote computer whether the computer is online or offline. A computer is "online," in Google's view, when a wired connection connects the computer to information sources, and offline when it does not. To allow the transmission of information when the computer is offline, Google continues, the patent discloses the use of an alternative communication path through a receiver. Google argues that a "data channel" must be a path that does not include the attached receiver, because the claim recites "notifying said devices . . . whether said devices are online or offline from a data channel associated with each device." According to Google, "whatever communication path the devices 'are online or offline from' must be different from the communication path the receivers use to notify the devices" because, if a path were capable of transmitting information to a device, the device would not be "offline" from that particular path. Whereas Google focuses on the phrase "whether said devices are online or offline from a data channel associated with each device," SimpleAir focuses attention on "data channel" that appears within this phrase. SimpleAir asserts "the term 'data channel' was a well-understood term with different meanings depending on context," and that in the '914 patent "it was used in the context of Internet broadcasting." SimpleAir explains that "in the context of Internet broadcasting, 'data channel' meant a path for viewing a category of information from an online provider." SimpleAir thus views "data channel" as analogous to a television channel such that users can tune in to a channel which is accessed by software on the user's remote computing device. Under SimpleAir's interpretation, the "remote devices" of claim 1 "have one or more 'data channels' 'associated with' them." SimpleAir supports its interpretation by reference to the specification, which states that a user can subscribe to receive broadcasts of data feeds, and asserts that "data feed" is another way to convey the concept of "data channel." As SimpleAir sees it, a "data channel" is "'not merely a connection to the Internet' but instead a connection to a 'category of information that is provided by an information source.'" The district court found SimpleAir's position more persuasive and construed "data channel" as one or more communication channels or paths for accessing or viewing a category or subcategory of information that is provided by an information source over a network. In concluding that a data channel is not merely a network connection or path between the computing device and the Internet, the district court relied on discussion of "data feeds" in the written description of a continuation application of which led to the '914 patent. It concluded SimpleAir's positions were supported by the specification and claim language. The District Court Also Erred in Construing "Whether Said Devices Are Online or Offline . . ."
The district court construed the larger phrase "whether said devices are online or offline from a data channel associated with each device" to mean "whether the remote computing devices are or are not connected via the Internet or another online service to a data channel associated with each computing device at the time the preprocessed data is received by the receivers." The court explained that "construing the data channel to merely be the device's connection to the Internet" would "render the additional language [i.e., 'from a data channel associated with each device'] redundant." The district court's construction is incorrect. It is true that interpretations that render some portion of the claim language superfluous are disfavored. The preference for giving meaning to all terms, however, is not an inflexible rule that supersedes all other principles of construction. "Claims must always be read in light of the specification." Phillips v. AWH Corp., 415 F.3d 1303 (Fed. Cir. 2005) (en banc). In addition, claims must be given meaning consistent with how they would have been understood at the time of invention by a person having ordinary skill in the art ("PHOSITA"). Importantly, the PHOSITA is deemed to read the claim term not only in the context of the claim in which the disputed term appears, but in the context of the entire patent. The construction that stays true to the claim language and most naturally aligns with the patent's description of the invention will be, in the end, the correct construction. The patent explains that, at the time of invention (i.e., 1996), computer users could connect to information sources such as the Internet using a modem. Modems were known to enable communication over telephone lines. The written description explains that the invention allows for "information . . . from information sources" to be "transmitted wirelessly . . . to personal computers" and can also be sent simultaneously via a wired connection to the same personal computers having Internet/World Wide Web access (direct or via online service providing Internet and Web access). By transmitting information wirelessly via the central broadcast server, "the present invention" enables a remote computer to receive information instantly—even while it is off-line (i.e., not connected to the Internet or some other on-line service). "Thus, a user has the ability to receive 'on-line' information even when the user is 'offline." Once the notification information is received, the user can then "instantaneously retrieve further detailed information," facilitated by "wirelessly broadcasted URLs, associated with the data, that are embedded in data packets and provide an automated wired or wireless connection back to the information source for obtaining detailed data." The patent explains that connection 24 may be "wired or wireless" and may be "either through a modem, TC[P]/IP or LAN-type connection." In light of this context, a PHOSITA at the time of invention would understand that a key aspect of the invention is the ability of a remote device to receive notifications even when it is not connected to the Internet by traditional means. The claim term "whether said devices are online or offline from a data channel associated with each device" is properly construed to mean "whether said devices are or are not connected to the Internet (or some other online service) via a data channel associated with each device." Moreover, the invention contemplates the use of two distinct paths, such that the data channel from which the device is offline must be different from the communication path used to receive notifications. Thus, "data channel" is properly construed to mean "any path between the remote computing device and the Internet (or some other online service) that does not include the attached receiver." When the patentee amended the patent in 2004, it chose to use the term "data channel," which does not appear in the written description, rather than the term "data feed," which does. The term "data feed" is also used in certain dependent claims. The choice to use "data channel" in claim 1 rather than "data feed," notwithstanding use of the latter elsewhere in the patent, lends further support to our conclusion that "data feed" does not carry the same meaning as "data channel." Different claim terms are presumed to have different meanings. Google asserts that if these terms are construed such that "data channel" is "a path different from a path through the receiver," it does not infringe because its "accused system sends messages over the same communication path as other Internet data—it does not use a separate path." SimpleAir does not contest this assertion on appeal. We therefore conclude that no reasonable jury could have found infringement under the proper claim construction, and remand with instructions to enter judgment of no infringement. The Supreme Court has instructed that "a patent is invalid for indefiniteness if its claims, read in light of the specification delineating the patent, and the prosecution history, fail to inform, with reasonable certainty, those skilled in the art about the scope of the invention." Nautilus. Google asserts "the term 'a data channel' renders all claims indefinite" because the patent does not explain what "offline from a data channel" means. It further notes that the claim construction order relied on specification passages that do not speak to the meaning of "data channel." We have already discussed these asserted omissions and explained why a PHOSITA, reading the claims in light of the specification, would be reasonably certain as to the scope of the invention. The challenged claim language ("whether said devices are online or offline from a data channel associated with each device") is sufficiently definite under Nautilus. Clare accused Chrysler of infringing claims of the '795 and '583 utility patents by selling Dodge Ram pickup trucks equipped with the RamBox Cargo Maintenance System. The patents are directed to a hidden storage compartment in the side of the bed that does not alter the external appearance of the bed and does not significantly reduce carrying capacity of the bed. This is done by placing the storage area in the side of the bed adjacent to the wheel well area, and along the length of the bed such that those with intent to steal tools would not recognize the hidden storage arrangement. At issue are the claim limitations relating to the external appearance limitations: "the hinged portion is constructed such that the truck has an external appearance of a conventional pickup truck"; "the bed being constructed such that the pickup has substantially the external appearance of a pickup without the built-in storage". The district court gave these limitations the same construction, as "the hinged portion is constructed such that the storage box is not obvious from the outward appearance of the pickup." 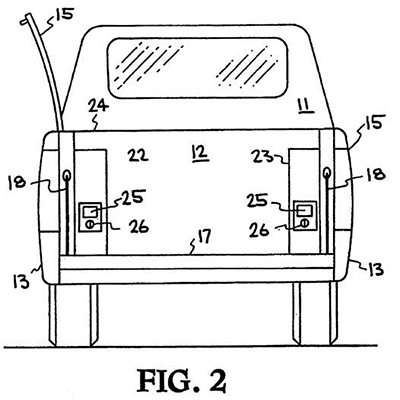 The court granted Chrysler's motion for summary judgment, both as to literal and equivalents infringement, holding that no reasonable juror could find that the RamBox, with its visible distinctions of the external hinged panel, is not obvious from the outward appearance of the truck. Clare asserts that the district court's construction improperly removes the "conventional pickup truck" frame-of-reference from the claims, improperly imports the theft-deterrent purpose of the invention into the claims, and conflicts with the patentee's express definition of the limitations in the prosecution history. Clare asks that we hold that the external appearance limitations do not need a construction because the limitations are readily apparent to a lay person. 1. A pickup truck comprising . . . a bed; the bed comprising: two opposed side panels which are contoured and generally in line with the contoured sides of the forward area of the pickup truck . . . a hinged panel providing access to the storage compartment, the bed being constructed such that the pickup has substantially the external appearance of a pickup without the built-in storage. 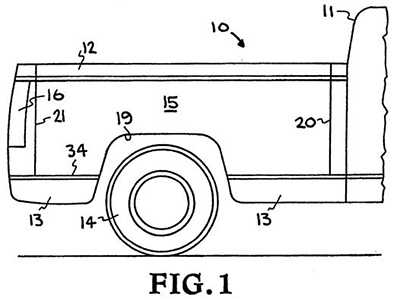 The specifications state that the pickup truck "has been modified in accordance with the present invention, with the only indication of such modification being the cuts, small spaces, or lines 20 and 21 in the side panels 15, as shown in FIG. 1, with the side panel being closed." The other features of the storage area are not visible: the portion of the storage areas, marked with numbers 22 and 23 in figure 2, above and to the side of the rear wheels does "not extend to the top or upper surface" of the bed; the latch mechanism and key lock, marked with numbers 25 and 26 in figure 2, are "mounted in the rear of each of the boxes," which are hidden in a back portion of the truck bed as shown in figure 2; and the hinges are located on the interior of the storage compartment, as shown in figure 3, such that they are "not visible from the exterior." Accordingly, the district court's construction of the external appearance limitations is well-supported by the intrinsic record. Clare first argues that the court should not have construed the external appearance limitations because the words "external" and "appearance" are readily apparent to a layperson. We disagree. Although those words may be readily apparent to a lay person, there existed a fundamental dispute regarding the scope of those limitations. Clare argued to the district court that the scope of the external appearance limitations should focus on the visibility of the internal storage box structure, not the external hinged panel. According to Clare, even a fluorescent orange external panel on a white pickup truck stamped with large black letters saying STORAGE would meet the limitations so long as the inside of the storage box itself could not be seen from the outside of the pickup truck. Chrysler, on the other hand, argued that the scope of the external appearance limitations should take into account the external hinged panel used to access the storage area. The district court correctly resolved this dispute by construing the external appearance limitations as directed to the outward appearance of the pickup truck, which takes into account the outward-appearing hinged panel. Clare next argues that the external appearance limitations contain two distinct sets of limitations that should be construed separately. Clare does not propose an alternative construction for either set of limitations, but the ordinary meaning of "substantially" has often been recognized to mean "largely but not wholly that which is specified." Although the doctrine of claim differentiation is not as strong across related patents as it would be if the different claim limitations appeared in the same patent, applying the doctrine here indicates that the '795 claims at issue require the inventive pickup truck to appear identical to a conventional pickup truck. Such a construction, however, is problematic because the '795 specification is clear that the inventive pickup truck is not identical to a conventional pickup truck—vertical cut lines are visible from an external appearance. In view of the specification, there is no way to read the '795 claims at issue as requiring the inventive pickup truck to appear identical to a conventional pickup truck. Clare argues that the district court's construction improperly imports the patent's purpose—the deterrence of theft—into the claims. To the contrary, the district court properly determined that the claimed "external appearance" of the inventive truck must not have an obvious storage box. Finally, Clare argues that the district court's construction conflicts with the patentee's express definition in the prosecution history. During prosecution, the examiner rejected a number of claims with the "external appearance" limitation as indefinite. According to the examiner, these claims require that the inventive pickup truck "has an external appearance of a conventional pickup truck," but the cut lines make the inventive pickup truck visibly distinct from a conventional pickup truck. We disagree with Clare's conclusion for two reasons. First, the specifications do not contemplate visible hinges or latches. Second, the patentee's recitation of visible hinges and latches in the prosecution history cannot expand the scope of the specifications, particularly where the patentee incorrectly characterizes the specifications, which do not contemplate any visible features more obvious than vertical cuts. In view of the district court's construction of the external appearance limitations, the district court determined that no reasonable juror could find that the accused trucks met the external appearance limitations. In making this determination, the district court relied on deposition admissions by Clare's expert, Dr. Akin, who testified that the hinged panel of the RamBox's storage compartment, the lock, the two vertical and one horizontal cut lines, and the bed modifications are visible and apparent to a casual observer. The district court also relied on deposition admissions by Clare's two fact witnesses, who testified that the external door to the RamBox's storage compartment was obvious. Clare argues that there are genuine factual disputes that prevent a finding of non-infringement at the summary judgment phase. The evidence pointed to by Clare, however, is based on an incorrect understanding of the district court's claim construction. For example, Dr. Akin in his expert report states that the internal storage box in the modified Dodge Ram is not obvious because a casual observer would not know that a storage box is below the hinged panel; the hinged panel could be concealing an electronic panel or a fuel tank. Dr. Akin's statement misunderstands the district court's claim construction in two ways. First, a storage box is a separate element of the claim that must be met in order for the accused truck to infringe. If the accused truck has an electronic panel or fuel tank instead of a storage box, then the accused truck does not infringe the storage box limitation, regardless of the external appearance of the truck. Second, the external appearance limitations as construed require that the storage box, including the portion of the storage box on the side panel of the truck that opens up to expose the storage area, is not obvious from the outward appearance of the truck. 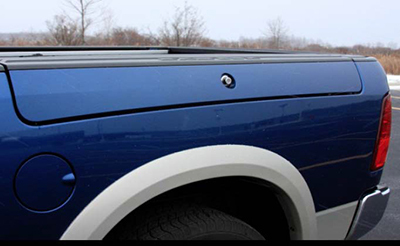 If the panel is obvious from the outward appearance of the pickup truck, then the external appearance limitations are not met. Clare also points to Dr. Akin's expert report that discuss his opinions as to why the external panel of the RamBox is not obvious: the panel has matching contours, matching paint colors, matching texture, inconspicuous cut lines that follow the body lines of the bed, and vertical lines that are placed at an angle to match nearby structures while maintaining a flush fit between the panel and the side of the bed. The district court evidence contained many pictures of the accused products from relevant viewpoints. Two such pictures are shown below. Reviewing the evidence de novo and drawing all reasonable inferences in Clare's favor, we agree that no reasonable juror could find that the hinged portion of the RamBox's storage compartment was not obvious from the outward appearance of the accused trucks. The district court correctly construed the external appearance limitations and granted summary judgment of non-infringement. The decision of the district court is therefore affirmed.